Meaghan and Ross Nichols are the energetic, hardworking couple who own and operate High Hopes Farm on a beautiful 120ish-acre piece of land in Bristol, just four miles from downtown Damariscotta. The couple purchased the farm earlier this summer, and already have a small, thriving operation with thoughtful plans for continued growth. Meaghan and Ross both grew up in the area, and didn’t even consider looking at other farms because they knew they wanted to stay in their community. “We chose to farm here because for years we had seen the farm, and it didn’t seem very active. This is our home town and I wanted to see this farm come back to life again,” says Ross. 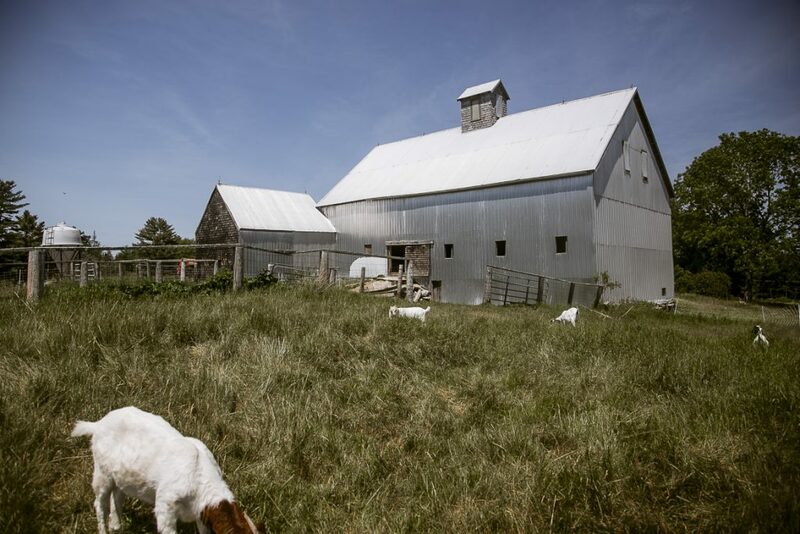 When the couple bought the farm, MFT purchased an easement on the property, lowering the cost for the young farmers, and ensuring that High Hopes will remain available for farming for future generations. 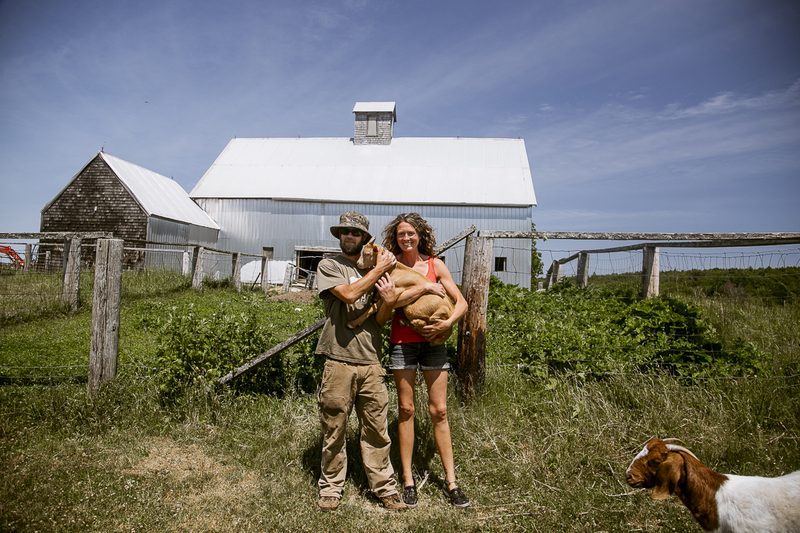 Young farmers like these two aren’t just feeding their neighbors; they’re helping to build a strong foundation for the local economy, stewarding the environment, and creating greater food security in their community. She also loves that their location gives customers a chance to see the hard work they’ve put into the farm, and to see their happy and healthy animals. Meaghan and Ross raise lambs, pigs, goats, turkeys, chickens and ducks for meat. Their animals are meticulously cared for and raised in natural settings, with lots of space to roam, fresh air, clean bedding, and even homemade sourdough bread scraps, thanks to Meaghan’s mom. I visited High Hopes for the first time a few weeks ago. Meaghan and Ross were busy planting tiny tomato seedlings and there were only two goats and a small flock of chickens. When I went back to the farm last week, the scene had changed. They’ve added a flock of ducks, many more chickens for both eggs and meat, turkeys, a group of mellow roosters (not a mean one in the bunch! ), and lots of sweet goats, and young pigs. Because MFT’s easement purchase helped to make the farm more affordable, Meaghan and Ross were able to buy some key pieces of farm equipment and some lightweight, movable fencing so they can easily rotate the pigs and goats onto fresh grass. All on the many farm animals are very well cared for by Meaghan, who admits that she can’t relax until she knows all the animals have everything they need. While they raise their animals and plant a few crops, Meaghan and Ross are also fixing up the old farmhouse to make it livable. This summer, they’re staying in a camper, in a beautiful spot by two ponds, tucked back from the road, and are just happy to be on the land, getting to know their new property. Meaghan and Ross welcome visitors to their farm stand, at 777 Bristol Road in Bristol, where you can buy seedlings, plants, eggs and some veggies, as well as sign up for meat shares. You can even tour their farm and see baby goats! Stay tuned for Meaghan’s amazing roast chicken recipe this Friday. To help support young farmers like Meaghan and Ross, become a member of MFT! Learn more about what we’re doing to protect more farmland, and get more farmers on the land HERE.